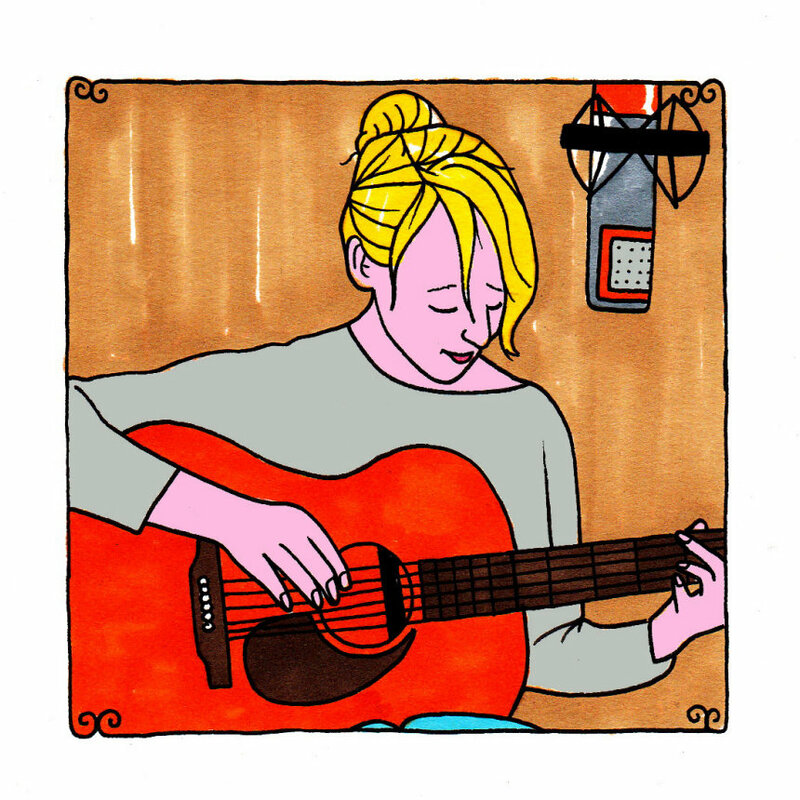 Laura Marling demands your full attention. She stands at the microphone that's been placed in front of her, with her skinny gray jeans on legs crossed down near the ankle, Toms shoes on. She looks to be as casual and at ease as a person could be. She flirts with the people who have gathered before her to hear her sing and play, explaining that the ring she's wearing on her ring finger is nothing like a wedding band and she's never been to Salinas, California. She doesn't have to beg for you to hang off of her every word, to meander with her tones and accents. You travel with her and these seemingly worn down and spectacularly distraught, but sweeter than bitter stories about lives that have been tested mercilessly. They are people who have felt too much. Perhaps she's the one who's felt too much, but if that were so, we could agree that no one's felt so much so beautifully ever before and no one's felt so perfectly. The English singer - originally from Eversley, Hampshire - appreciates cookbooks and one can imagine her standing over a huge stirring pot, in a quaint and compact kitchen, the boiling and baking turning the room into an aromatic sauna and Marling taste-testing the concoction with her trusty wooden spoon. She brings the soup to her lips, tastes and then pauses for a second to consider what more it needs. She gives it some more oregano, but carries on to include the secret ingredients. There are the pinches of both depression and the ability to combat such a feeling. A song such as "Don't Ask Me Why," from her magnificent 2011 album, "A Creature I Don't Know," has Marling offering the line, "Those of us who are lost and low/I know how you feel/I know it's not right, but it's real," coming from a familiar place for her, a place that's dense and expansive and short on answers, a place where the greatest number of us lay our heads at night. She's looking for some grace, something to water down the sting just a bit, but she knows that those feelings that she's rummaging through, or those that are rummaging her, are not specific. She's nowhere near along in those battles and it might be this acknowledgement in their proliferation that brings out one of the finest qualities in her and on her albums. It's a patience with the madness and the loneliness that might consume her, that might get to her a little more when she's working over a bottle of Melbec, when she's pouring glasses and the voices are low and steady, soft and calm like the candlelight splattering the room, the table and the furniture. You can almost hear this soft yellow light wrapping around the air as she sings, birthing the words itself. We want what she sings. We want to feel exactly what she was feeling when she originally penned those words, when she originally rolled them around in her mouth to make them sound the best, the saddest. Is it possible to be precocious as a young woman in her 20s? It's as if she knows all of these emotions in ways that it takes entire lifetimes to know them. The process by which she has attained these considerations and these very cordial relations with the deepest of sadnesses must be illicit. It must be something that we don't need to know about. She might skin her arm or knees and beneath that first layer, once we'd wiped the blood clean, we might see a second layer of skin, wrinkled and liver-spotted, proof of the aging that's gone on underneath. We listen, as we would to our sharp grandmother, that wise old bird who has cooked ten thousand dinners and raised eight children, telling us of the things she doesn't know and of the things she knows so intimately it hurts. Marling sings, "Me and time we go way back when/I was a child and I always knew why," as if she's been old forever, like she's never really been.